Rarely does the body rely on gravity in order to move substances through these tubes, instead it relies on the contractions of the muscle in the wall of the organ – a process called peristalsis. All of these tubes mentioned contain a special kind of muscle in their walls, called Smooth Muscle (this is different from the skeletal or striated muscle attached to the skeleton and different to the cardiac muscle which is found in the heart). When food, for example, enters the intestine from the stomach, the muscle at the start of the intestine will contract, squeezing the bolus of food a bit further along the intestine. 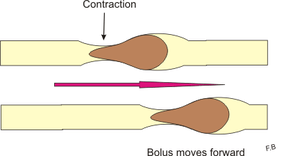 As the food bolus is squeezed along, the next bit of intestine will then contract, moving the food bolus even further. At the same time, the first bit of intestine stops squeezing, so it looks like there is a wave of muscle contractions moving along the length of the intestine. This process is found all over the body where there are hollow ‘tubes’ responsible for moving substances through the body.